Turning 50 – a 'peace' of my mind…. 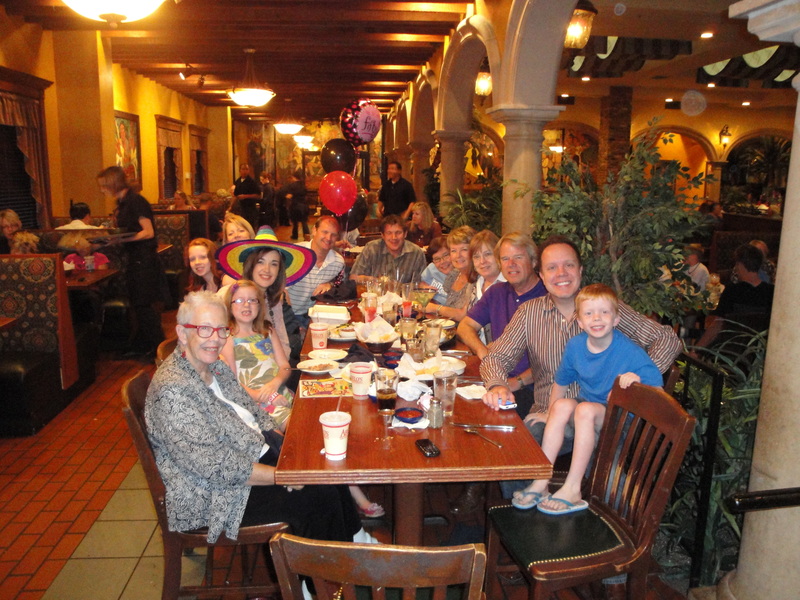 Birthday dinner at Abuelo's, my favorite Mexican restaurant. Thanks, Brandon, for planning a wonderful party! And I think I had one of the nicest birthdays I’ve ever had. I didn’t get a lot of presents. I didn’t get any present that cost a lot of money. Most of the presents were made by children. A painting of my name. A picture of a pig drawn on scratch paper. A pin. I went to dinner with some of my closest friends who put candles on a carrot cake and sang to me. And even though they made me wear a striped sombrero that made me look like a witch from Cancun, it was great fun. I think what made it so nice was the fact that I was content with what it was. Clear down to your socks contentment. Maybe that’s what turning 50 is supposed to be about. Not that you have everything figured out, or that you’ve gotten everything you wanted, but that you’ve learned to be content with all you have. And when I look around, all I have is a lot. I think before I would’ve left dinner and come home alone wanting more. No matter how many people were at the party, it still wouldn’t have been enough. Somebody would’ve still been missing. Plenty of people I love were missing from dinner at Abuelo’s tonight. People I can’t wait to celebrate my birthday with again. People who couldn’t be there because they live somewhere else. People who couldn’t be there because they’ve already gone home. But tonight was about relishing the ones who were there. Friendships that are rich and sweet, growing older and deeper all the time. That’s more than enough for now. But can you imagine the birthday parties in heaven?! Hugs back, Alyssa – thanks! Wow just think of all the amazing thing that have happened over the last 50 years… The next 50 are gonna be EPIC!! Yes, they are, Brother Smith – and I’m glad you’re gonna be part of those next 50 years! Wish you could’ve joined us, too, Elizabeth! chorizo-stuffed chicken – a definite yes – and I love you, too! Oh I wish you could’ve been with us, too, Lisa, you would’ve loved this bunch! Sure good talking the other night – look forward to seeing you soon! Thanks for always showing me the Sally I knew, but didn’t have enough time to know! I know that probably doesn’t make sense, but I mean it anyway! Love you, dear friend! Hope you have many more contented birthdays! Peggy, I can’t believe you’re gonna be 60! Man, we’re holding up well, aren’t we?!! Love you, too! So glad your 50th was great, glad you were fully content. Well, I might’ve been content, but that doesn’t mean I didn’t wish my North Carolina buddy could be here. Chips & salsa next year, right? !